Delta's Dark Den of Destruction: U.S. 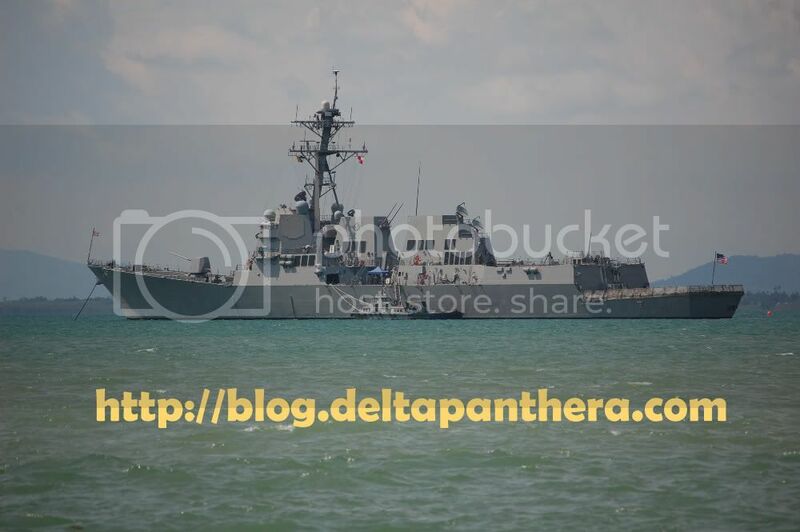 Warships Spotted off the Coast of Penang! 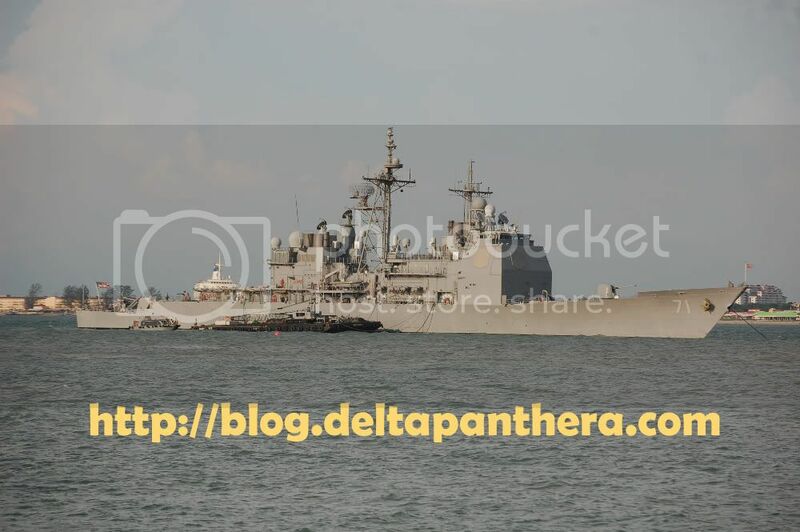 While taking photos for a little thing called Project Trafford on June 4th, 2008, we saw 2 U.S. Navy warships and a cruise liner off the coast of Fort Cornwallis. It wasn't until a couple of days later till we found out their names and purpose in Penang. 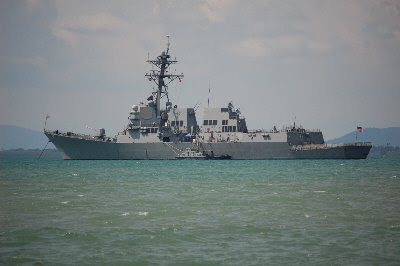 Now for something different, we spotted this ship right beside the navy vessels. 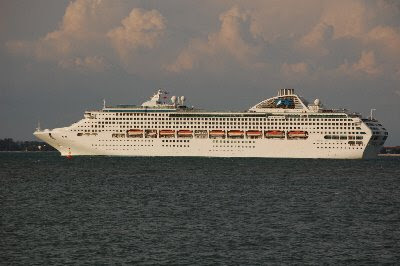 This is the Sun Princess, an Australian luxury cruise liner carrying 2,600 passengers. 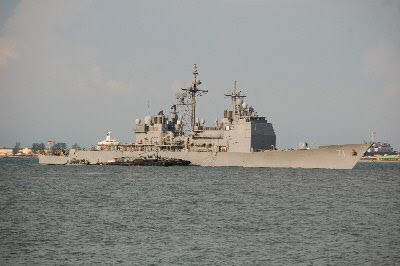 Here we have the Sun Princess crossing the path of the USS Cape St. George. 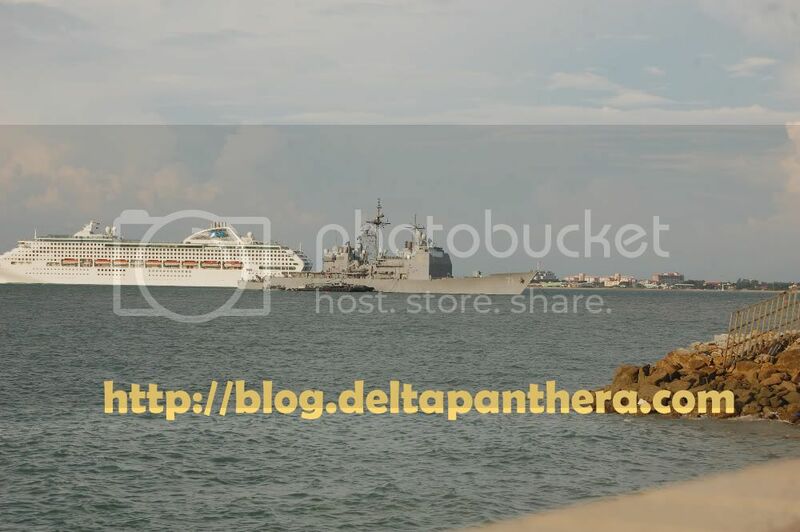 Hmm... luxury cruisers nowdays are escorted with warships! Hey, I saw you dropped through Entrecard on my website. I would PLEASE PLEASE ask you to add your link to my automatic link poster. It's the whole point of my site and currently I have like no links so you would be very high up. If you signed up, I would give you a free link spot on my website! Also, if you could post my link on your site so your friends can also learn about my services. If you do that, our link list will grow and grow! 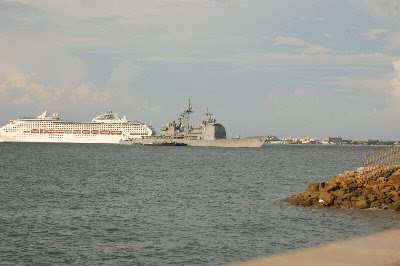 Warships are escorted with luxury cruisers. Better than the days I was in the Marine Corps! Well, the Navy as a rep to be lazy. Good to have your country under the protective eye of the US. Richard: Hey, being in the Marine Corps is even cooler! I gotta respect you for that. My name is Edward Skading, from Selangor, Malaysia. I am writing for your viewpoint and support towards a good cause campaign to protect and uphold our consumer rights. 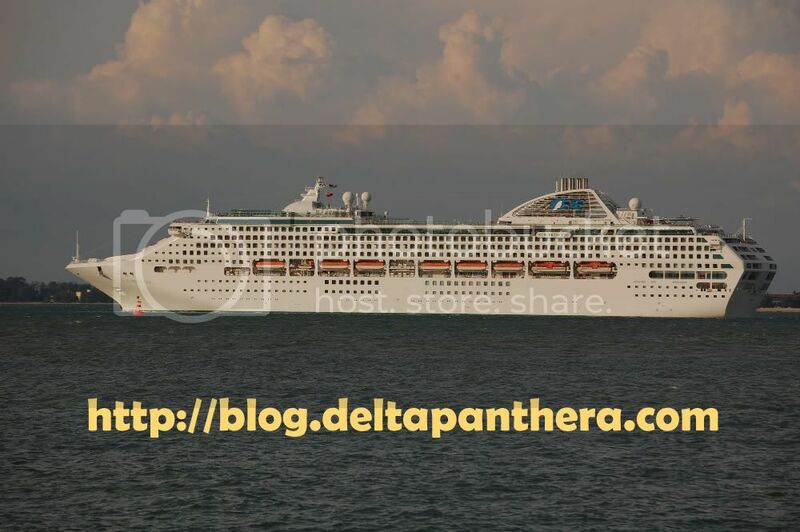 I am being sued by an arrogant corporate company (F&N Dairies (M) Sdn Bhd) because I exposed a horrible discovery concerning one of their products on my weblog. It is all about my shocking finding of an abnormal substance (mould) in a “Tea Pot” brand, sweeten condensed milk tin-can. You can read the full story (all the correspondence letters) and view photos of the contaminated milk and the disgusting hazardous conditions of F&N Dairies’ plant at my weblog http://consumersrighteousness.blogspot.com/. As a consumer, I am sickened by the fact that we are not provided utmost protection from this sort of situations and whatever consumer rights we have now are defenceless. I also feel that my human rights had been deprived when I am being forced to silence and on top of all, I feel cheated when the company executive responded to my grievances that they are not liable for damaged products in the marketplace. I am only requesting that the company be truthful, reliable and accountable for their mistakes, moreover produce cleaner and safer food. I believe, it is the responsibility of our whole society to protect the rights and benefits of consumers, and all concerned parties should together strive to do the work of standing up for consumer rights, improving the consumption environment, and pushing for faster, better economic and social development. I sincerely hope you will cover my story on your weblog and tell it to the world. I would greatly value and appreciate your kind support.